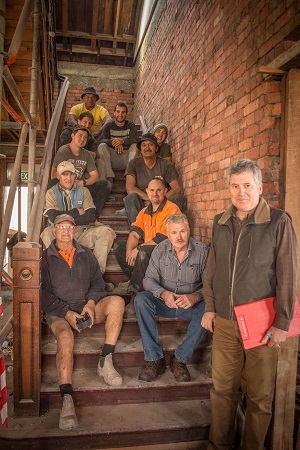 Rigg Zschokke Ltd is currently strengthening and restoring the former Seddon Memorial Technical School in Masterton that was built in 1908. Badly weakened in the 1942 Wairarapa earthquake, the brick building will be strengthened to 100 per cent of the building code. The project includes the restoration of the building’s historic features including a grand central staircase, original timber floors, decorative pressed metal ceilings and match-lined walls. The addition of a new kitchen and service facilities will adjoin the main building. An outdoor deck with a louvre roof and heating will be added ongside a landscaped garden bar adjacent to the main indoor bar area. The building restoration is expected to be complete by August, opening shortly after as a Lone Star restaurant. The restaurant will seat up to 90 people and separate function rooms will cater for 60 and 25 people respectively.